On April 26th our family of four will run the Times Colonist 10K in beautiful Victoria BC. Actual runners will be myself, my husband and our 8-year old daughter. 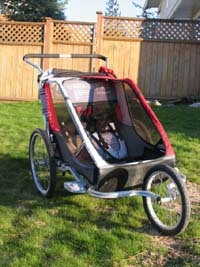 Our 4-year old son will be enjoying the race from the comfort of the jogging stroller, which we will take turns pushing. Kudos to Charriot for making a sturdy, lightweight stroller. We have definitely gotten our money’s worth. We have rigged up the stroller with a special pocket for the Blackberry which will be used to livestream the entire event. Yesterday we tested the video equipment we will use to livestream our run by driving the course in the car and streaming to our Qik account. It worked, but wasn’t as clear as we would have liked. We’re studying both the Blackberry and Qik.com websites to see if there’s anything we can do to optimize the video quality. If you have any advice please leave a comment below. Next we need to test the equipment on the jogging stroller to make sure it doesn’t vibrate too much and get the right line of site. The course is all road so it should be fine. The main reason for broadcasting the race is so family and friends in Japan and Ontario can see it live. I know there are many runners that would love to come to Victoria to participate in the race but for obvious reasons weren’t able to make it. We hope to enable them to at least see the course and the race and we would love to get them over here next year. If you are thinking of coming to Victoria for the TC10K, or any other race, marathon or triathlon, please contact us, we will be happy to help make arrangements.